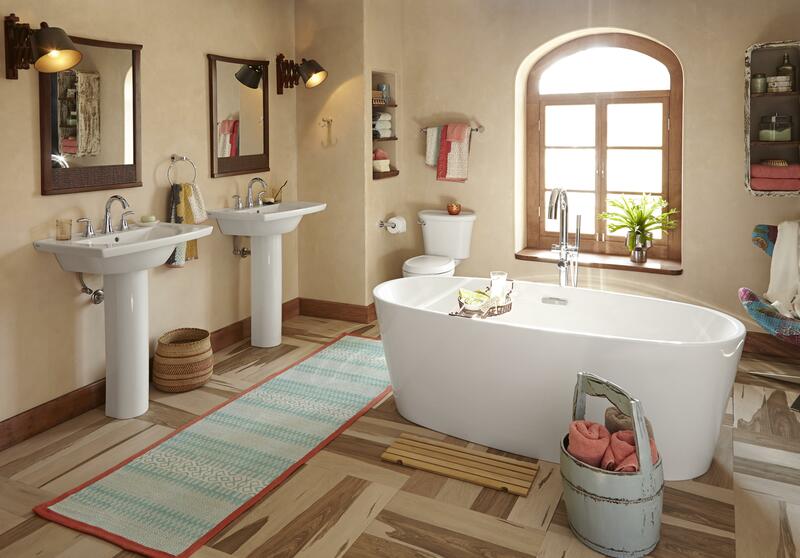 Make a striking focal point the foundation of your spa-like bathroom. (BPT) – American homeowners’ desire for spa-like bathrooms shows no signs of waning, says the latest Design Trends report by the National Kitchen and Bath Association (NKBA). From freestanding bath tubs and floating vanities to LED lighting and soothing color schemes, some of the most-requested bathroom renovations focus on creating the atmosphere of luxury and calm found in world-class spas. With the average mid- to upscale bathroom remodeling costing in the range of $30,000, homeowners are also looking for the most cost-effective way to create that spa-like feeling. Many are opting to build their bathroom renovations around a focal point, such as a freestanding tub or luxury shower, and round out the effect with more modest accessories and fixtures. Homeowners are choosing to install freestanding soaking tubs in their master bathrooms, in particular, to create an exclusive sanctuary of relaxation. In fact, in 2016 half of NKBA members were asked to install freestanding tubs in bathroom remodels, and 60 percent expect to be doing more of them in 2017. Traditionally styled freestanding tubs were often claw-footed fixtures that meshed well with conventional design themes, but struggled to fit into the sleek, contemporary lines associated with a spa-like setting. Strikingly modern freestanding tubs offer expanded design flexibility as a focal point in today’s spa-inspired bathroom settings. Options like the American Standard Coastal-Serin Freestanding Tub in high-gloss cast acrylic enhance the deep soaking space of a luxurious tub with a clean, simple and modern profile that fits well in spa-like bathroom design. Few bathroom fixtures speak of luxury as clearly and loudly as a showpiece bathtub. A deep, sumptuous freestanding tub not only provides a restful spot for a soothing soak after a long day, it also serves as a striking visual focal point for modern baths. Already have a standard alcove tub, but still want to create your spa at home? Try installing a deep soak tub drain, which has a unique overflow feature that allows 2-inch deeper water than a standard bathtub drain. This universal drain works in most standard bathtubs – and that could be yours. Replacing a standard toilet seat with an upscale option like the DXV AT100 SpaLet Electronic Bidet Seat furthers the luxuriousness of the bathroom without the cost commitment and permanency of installing a full bidet. Its heated seat, choice of water temperature and volume for the two cleansing wands, and the oh-so-decadent warm air dryer are the ultimate self-indulgence to bring the spa right into your home. Wood vanities and storage cabinets for bath linens continue to be popular with today’s consumers. Floating vanities and open shelving, which are gaining in use with interior designers and homeowners alike, can further the effect of an upscale spa by creating a visually clean, uncluttered effect. Soft, pale greens and aquas have long been associated with spa-like design, but in 2017 bathroom color choices are trending toward grays, off whites, blues and violets, according to the Design Trends report. Sedate and subtle are the hallmarks of spa color schemes, so when choosing yours keep in mind the calm effect you want to achieve. Also, remember your color scheme doesn’t have to be limited to the walls; consider incorporating your chosen colors into cabinetry, countertops and accessories. Flexible lighting is also key for a spa-like bathroom. Remember to incorporate brighter lighting where you’ll need it most, such as around vanities, and add features like dimmers that will allow you to reduce the amount of light in the room when you want to create a relaxing atmosphere. Finally, adding touches that appeal to all your senses, such as music, mood lighting and aromatherapy can elevate a bathroom to a spa-like environment. Whether you opt for a full surround system in your bathroom or add waterproof blue tooth speakers in the shower, it’s easy to bring music into your spa bath. Scent adds yet another layer of luxury and is easy to achieve, whether you choose a simple arrangement of essential oils and diffuser reeds or an electronic diffuser that gently mists aroma into the room. Americans view their bathrooms as more than just a room to take care of business. Infusing your master bathroom with spa-like features can turn the room into an oasis of relaxation and luxury. This entry was posted in Real Estate on March 3, 2017 by Mike.